To order training books by Teaching Humble Hearts, please send us an inquiry. 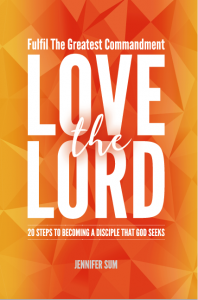 Love The Lord presents a collection of answers to common obstacles that prevent Christians from fulfilling the greatest commandment of all: to love God with all our heart, soul, strength, and mind. Once we are able to do this, we will become the true worshippers that our Heavenly Father seeks. This engaging study book packs biblical insights and practical tips in twenty succinct chapters that will transform the way you relate with God. We all want our loved ones to speak warmly, intimately and openly with us. Can our prayers with God be the same? Is it possible to pray in a way that God will answer? Are we all equipped to pray in power? How can we pray for others more effectively? “Abba” is an Aramaic word children use to respectfully and affectionately address their fathers. One could say the closest English equivalent is the word, “Daddy”. 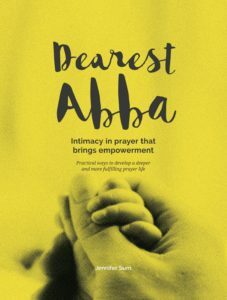 Dearest Abba is about the trusting and intimate relationship we can have with our Father in heaven, and how our prayers can and should be radically transformed by this connection. This concise book covers some common questions and misunderstandings about prayer, and includes thought provoking topics for group discussions. Great things can happen when God is in the centre of any relationship. This is especially true in mentoring relationships. As believers are led to grow into their God-given identities, their unshakeable faith and love for God will transform families, workplaces and societies – often with eternal consequences. But what is mentoring? How does one mentor in a godly way? What does a healthy mentoring relationship look like? What are our goals? How should mentors tackle hardened attitudes or sensitive issues? Mentoring need not be intimidating or mysterious for Christians, particularly when we have God as our helper and the Bible as our manual. Jesus Christ promised to be with us “always, to the end of the age” when He asked us to “make disciples of all nations”. 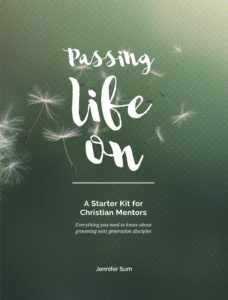 Passing Life On addresses many typical questions and apprehensions about Christian mentoring with practical suggestions and Biblical guidance.